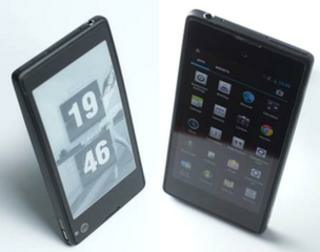 A smartphone with two screens - one of which uses e-ink technology - has been announced by a Russian company. Yota says having an added low-power screen will help users keep across social network updates and show critical information that stays visible even if the handsets run out of power. It plans to put the 4G Android device on sale by the second half of 2013. But one analyst said the innovation was a "gimmick" which might struggle to do well in western markets. Saint Petersburg-based Yota is best known for making modems and router equipment. It says it plans to sell its handset at the premium end of the market which is currently occupied by phones such as the Samsung Galaxy S3, HTC One X and Sony Xperia T.
E-ink displays are commonly used for e-book readers and are easier to read in the sun than their LCD equivalents, but offer a slower refresh rate making them unsuitable for videos or most games. Yota says both the colour LCD and black-and-white e-paper displays would be 4.3in (10.9cm) in size, and placed on opposite sides of the device's body. Both would be protected by impact-resistant "gorilla glass" developed by the US company Corning to reduce the risk of breakage. Yota's chief executive said he believed other companies had not previously launched similar devices because in the past there had not been a clear need for users to want a second screen. But, he added, changing habits had created a gap in the market. "Two years ago we were not so dependent on all the kinds of information we consume now, from Facebook and Twitter to news and other RSS feeds," Vlad Martynov told the BBC. "The smartphone is now a window onto this virtual life, but today there's a lot of disappointment when you miss information. "Our electronic paper display with our applications will remove this irritation." In addition to letting users dedicate different tasks to different screens, Mr Martynov suggested users might want to display important information such as an airline boarding pass or a map on the e-ink screen to take advantage of the fact that the technology only uses power to refresh - and not maintain - its image. As a consequence the phone keeps showing the last graphic or text sent to its second display even if its battery has died. Yota says it has been working on the project for two years, but that it still needs to complete work on the five or six apps that will be bundled with the device to make use of its second screen. Ultimately if the handset proves popular, it says it hopes third-party developers will customise their programs for the innovation. However, one industry watcher cast doubt over whether that would happen. "I don't see many users wanting this device in the US or Western Europe," said Francisco Jeronimo, research manager at consultants IDC. "China may be different - they like more gimmicky phones that can handle several Sim cards and feature unusual types of display - but none of those devices have done well elsewhere. "Brand is quite a strong purchasing decision factor in western markets as well, so unless this were being promoted by a company like Samsung or being sold at a very low price I can't see much demand." Yota says it plans to debut its handset at the Mobile World Congress in Barcelona in February. It says it then aims to manufacture the device in Asia so that it can go on sale in Russia "in the summer", and Europe, North America and the Middle East before the end of the year.